•In a complex premises liability case, represented a woman severely injured in poolside fall, settling the case for $7.5 million in damages. My client slipped and fell on the deck of a resort pool -- where the non-slip safety surface had worn away. A serious ankle sprain developed into Complex Regional Pain Syndrome, a chronic condition that causes searing pain and difficulty with motor function. •Eveland vs. San Marcos Unified School District, Rydell, Inc. Achieved a nearly $5 million settlement for disabled Mission Hills high school football player Scotty Eveland, who collapsed during a game four years ago. More than 250 depositions were taken in this vigorously contested case, a record for any personal injury case in San Diego. •Marilyn Cooper v. Troon Golf, LLC and The Crosby National Golf Club, LLC , et al. In a case that reaffirms the right to safe public access for the physically disabled, attained a $1.25 million out-of-court settlement involving the country’s longest survivor of Amyotrophic Lateral Sclerosis (ALS). •David Finley v. Club One, Inc. Named one of the Consumer Attorneys of San Diego’s “Outstanding Trial Lawyers” for this case, achieved $1.8 million jury verdict for David Finley, after he fell and obtained serious injuries at a fitness facility. I have been a CaseyGerry attorney for more than 25 years, and specialize in the trial of serious personal injury cases -- including brain injury and head trauma -- and wrongful death cases, as well as cases that involve major highway design and automobile products liability. I have successfully handled many high-profile cases, including tragic losses involving wrongful death, paraplegia, serious head injury, quadriplegia, severe burns, loss of limbs and other cases involving major orthopedic injuries, and have attained multimillion-dollar results in cases ranging from maritime accidents to premises liability. I am a member of the American Board of Trial Advocates (ABOTA), an organization comprised of the country’s leading plaintiff and defense trial counsel, and am also a member of the San Diego County Bar Association, American Association for Justice and Consumer Attorneys of San Diego. I served as president of the Consumer Attorneys of San Diego in 2005. I have obtained five “Outstanding Trial Lawyer” Awards from Consumer Attorneys of San Diego, and am consistently selected by my peers for inclusion in The Best Lawyers in America. 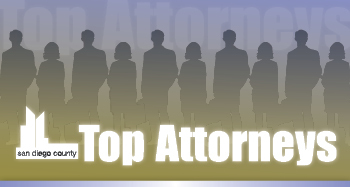 Additionally, Super Lawyers magazine has listed me as one of San Diego’s outstanding personal injury lawyers for the last eight years, also naming me one of the top 50 lawyers in San Diego. I also help instruct other attorneys in litigation at the San Diego Inn of Court’s College of Advocacy and am a frequent lecturer for trial attorneys’ continuing education, both in California and nationally. I serve on the board of directors of HeadNorth, a Del Mar-based nonprofit dedicated to providing help and hope for spinal cord injury survivors. I was born and raised in Los Angeles and have lived in San Diego for more than 35 years. In my off time, I enjoy spending time with my wife and two young sons, and also enjoy running, weight training and golf.